Jay-Z performs on the 4:44 Tour at Barclays Center on Sunday, Nov. 26, 2017, in Brooklyn, New York. Here’s how JAY-Z follows in the footsteps of Nelson Mandela. JAY-Z is a committed advocate and philanthropist, championing causes ranging from universal access to water to fairness in the US criminal justice system. You can join us in taking action on these issues here. JAY-Z released his first album in 1996, and more than two decades later the hip-hop legend has entered an artistic and political renaissance, releasing in recent years some of his sharpest verses and building an empire of social justice along the way. In 2016, he released the soul-searching 4:44, named for serendipitous moments in his life, and this past June he joined his wife Beyoncé for Everything is Love, a boastful, steely, and fun album that showed the two superstars at the height of their skills, mastering new sounds and techniques, and surveying their careers and relationship with the confidence of Marvel superheros. While JAY-Z, whose given name is Shawn Carter, was busy exploring his inner life across dozens of songs, he was also furthering his philanthropic work and speaking out politically. More often than not, his art and activism have been intertwined. He released a short animated documentary in September 2016 through the New York Times, called “The War on Drugs Is an Epic Fail,” in which he describes the racist patterns of the criminal justice system. Then he produced a miniseries on Kalief Browder, a man who was arrested at 16 on a false accusation and forced to spend more than 1,000 days in New York’s notorious Rikers Island prison, more than two years of which were in solitary confinement, which the United Nations considers a form of torture. Browder died by suicide a year after being released. JAY-Z’s next venture, out this summer, is a miniseries that explores the murder of Trayvon Martin and the subsequent rise of the Black Lives Matter movement. These productions are as much about clearing up disputed narratives as they are about informing people so that they can get involved and take action. As JAY-Z said in an interview with New York Times executive editor Dean Baquet, he can only do so much by himself. It’s when other people get involved, he said, that real change is possible. That’s similar to the purpose of Global Citizen, which aims to build a global movement to end extreme poverty and its many causes and consequences. In fact, Global Citizen counts JAY-Z as one of its biggest supporters. JAY-Z performed at both the 2014 Global Citizen Festival in New York and at the 2016 Global Citizen Festival in Mumbai, India. 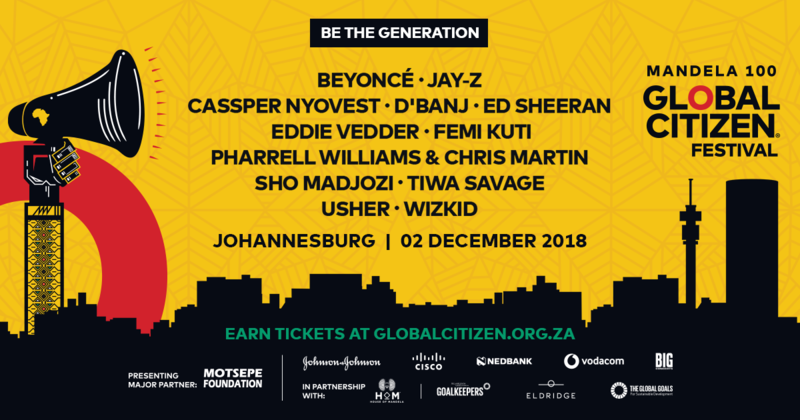 Now he’s going to be performing in South Africa on Dec. 2 at the Global Citizen Festival Mandela 100, in proud partnership with the Motsepe Foundation. But the hip-hop legend who grew up in Brooklyn public housing has been giving back for decades. The Shawn Carter Foundation was formed in 2003 to improve the opportunities of at-risk youth, and has since donated more than $4 million to community and scholarship programs. Throughout his years touring, JAY-Z has often leveraged his shows to support people and causes. In 1999, the proceeds of a Denver show went to the families of the Columbine massacre victims. In 2001, he participated in “The Concert for New York City” to raise money for the victims of the 9/11 terror attack, and would later host a concert for the families of emergency service members who had died in the tragedy. The following year, he teamed up with Roc Nation for a show to raise funds for HIV prevention campaigns, the first of many HIV awareness efforts he would champion. His “Fade to Black” concert in 2003 donated profits to various charities, and in 2006 JAY-Z partnered with the United Nations for the Water for Life concert that brought in more than $300,000 for water and sanitation nonprofits, on top of a personal donation of $400,000 to PlayPump International. That particular show marked JAY-Z’s growing interest in improving water access around the world, a cause he continues to support to this day. At the time, he traveled to various countries for the documentary Diary of JAY-Z: Water for Life, which aimed to raise awareness of the fact that hundreds of millions of people lack access to safe water. Over the next decade, JAY-Z supported countless other charity concerts, such as participating in the Africa Rising Festival, donated millions to various causes, and continued his ongoing community outreach through efforts that included giving out presents and dinners in public housing. Soon his efforts would become more political and focused on systemic change, signifying a shift toward that same type of movement building he spoke of in his interview with the Times. In 2006, police fired 45 bullets at Sean Bell, killing the unarmed black man, whose family JAY-Z went on to support. JAY-Z grew up surrounded by police brutality and the incarceral excesses of the war on drugs, but the late 2000s and early 2010s were when the movement against these injustices began to reach a zeitgeist moment. And JAY-Z was ready to play a leading role. He has since called for an end to mass incarceration, police brutality, and predatory practices in impoverished communities. He’s called for bail reform, holding police officers accountable for violence, and expanded access to voting. In 2016, he donated $1.5 million to Black Lives Matter through a concert hosted by his streaming service Tidal. These efforts seem to be paying off. Prison and bail reform are increasingly mainstream ideas, with progressive attorneys general and judges being elected across the country. (Global Citizen is currently campaigning to end cash bail. You can read more about it here). Last year, JAY-Z directly helped families affected by unjust laws by bailing fathers out of jail for Father’s Day. That was just one his charitable acts in 2017. He also organized concerts to help victims of Hurricanes Maria, Irma, and Harvey, and continued to uplift young people by sending a bunch of high schoolers to college, according to VH1. Later this year, at the Global Citizen Festival Mandela 100, JAY-Z will honor one of the greatest humanitarians in recent history — Nelson Mandela. Like JAY-Z, Mandela’s interests were far-ranging, encompassing humans across the world, and ultimately aimed at achieving universal equality. Only a handful of people can be put in the same league as Mandela, but JAY-Z sure is following in his footsteps.